Slightly shaped ground beef balls 1 1/2 inches. Add peppers and onion to meatballs; cook 5 minutes, stirring occasionally. Drain tomatoes, reserving liquid. Cover and simmer 5 minutes. Mix the reserved tomato liquid with flour, stirring until smooth. Stir the meatballs, cover and simmer for 5 minutes or until slightly thick. Meanwhile prepare Italian Bread Basket and place on platter. Spoon mixture around dumplings and bread. Garnish with green pepper rings and cherry tomatoes, if desired. Cut a slice from the top 3/4 of the bread. Brush the top, side and inside of bread with melted margarine. Sprinkle loaf with Parmesan cheese, coating sides evenly. Bake in hot oven (400 degrees F.) for 10 minutes. In a large bowl, combine ground beef lightly with corn chips, milk, eggs and salt 1 teaspoon. Roll meatballs lightly in 2 tbsp flour, coating completely. In a large skillet, cook meatballs in hot butter, half at a time, stirring until browned evenly. Remove the skillet meatballs they are browned. Stir in onion. Add tomatoes, green peppers and olives. 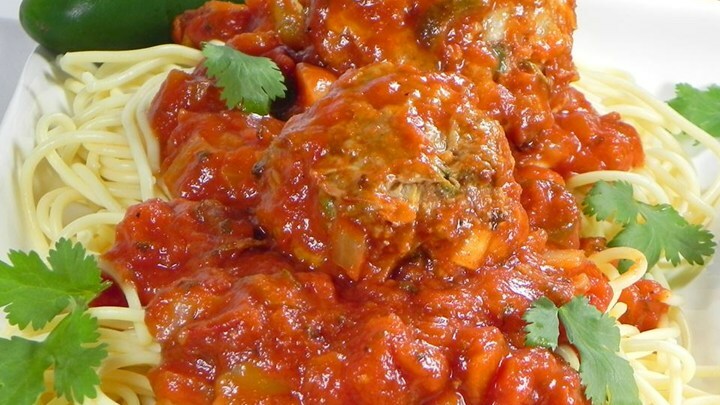 Add the meatballs in tomato sauce, cover and simmer for 20 minutes. Uncover and cook slowly 10 minutes. Serve meatballs and sauce over hot Mexican Rice. Baking pan 13 x 9 inches, layer 1 cup cooked rice, 1/2 mixture of sour cream, pepper and 1/2 cheese strips. Repeat layers and top with remaining rice bowl. Sprinkle with Parmesan cheese and top with meatballs and sauce.